In Bible times, why were city gates so important? Dr. Reagan: The city's gate was a very important place, wasn't it? Dr. Fleming: Yes, amazingly. A city gate is normally located on the hill where your town is set so it has nice access to the plain or valley outside. Because it's usually a lower approach where your gate is, you have to make it extra strong. The easiest place to attack a city would also be the lowest access point. In response, you build up extra towers usually at the highest part. For defense, little loop holes are placed on the tower so you could fire out balls and arrows through them, as well as throw down things that aren't very nice on your enemy, such as hot oil. That certainly messed up your whole day! Under the road is often drainage, because it's also the lowest place in your town. So, there would have to be drainage going out of the town. 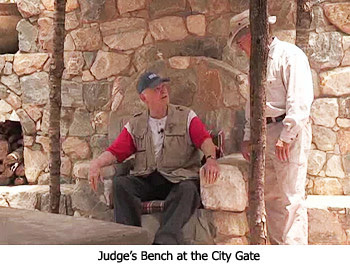 The most important aspect of the city gate is that it's where your judges sit. Dr. Reagan: I always read about them sitting at the gates in the Bible. The judges judge at the gate. Dr. Fleming: For the Center's gate towers, each has two gate chambers inside. It's interesting that 3,000 years ago these chambers were called Judge's Chambers, and they included the judges' benches. There would be a judge's chamber on either side and also then usually a U-shaped bench inside where the judges sit. Their placement would also serve as passport control. Dr. Reagan: So, nobody could just wander into this city? Dr. Fleming: The problem is a security problem. Are we friend or foe? Might we steal things? Do we want to stay the night? Usually there is an open area inside the gate where you would have guards and the people could stay. Also, there is usually a roof or two for those who maybe you don't fully trust them to be in town. Therefore, you can have them sleep up on the roof. If instead it's someone you have known over the years, you will have them go on in and stay at your inns and in people's homes. Not only is the placement of the judges by the gates for passport control, but birth records are kept at the gate. The Romans knew that Jews would try to avoid paying their high taxes to Rome for the body count, so they made them go to the place of their birth records. Even though in the Gospels Joseph was living in Nazareth, his birth records were kept in Bethlehem. That's why he had to go on that journey, because the birth records were kept at the gates. Even in a small town, you need three judges so there won't be a split decision. Sometimes a judge can't make up his mind, so there will be a good governor will visit the towns at least once a year to process those undecided cases. Understand that Herod Philip was such a governor over Caesarea Philippi which was his territory. Herod Antipas, though, he was not as conscientious. 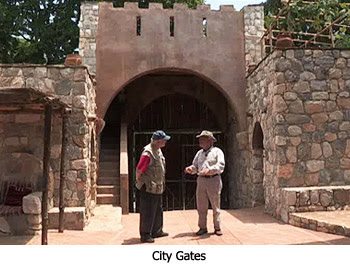 The gate is also where you might have some public meetings where crowds could be addressed at the city gate. When the governor or even more the king is visiting, you have a throne already set up for them, such as a little footstool area. This location would be used for the address of the important proclamations of the governor or ruler or even the king coming through. The judges' bench is usually covered in the shade. We found in archaeological digs some at the city gates. There are also benches nearby for assisting in important meetings. Dr. Reagan: Your judge's bench at the Center is soft and comfortable and has a nice covering. So, the important people sat there? Dr. Fleming: Yes, and folks who are the hoi polloi would come up and kiss your feet. Isn't it interesting the way the Bible says that to judge righteously if you're a prophet is to "lift up your heads, o ye gates." Now gates don't look like heads do they? But, gates have judges. Dr. Reagan: That's Psalm 24. "Lift up your heads, O gates, that the King of Glory may come in." Dr. Fleming: If you make bad judgments then your heads are bowed down in shame. How then can you say judge righteously and walk with your heads tall? The answer is that you deal justly in the land. And so, the gate is a very important symbol. 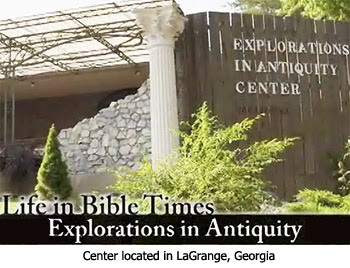 In the seventh part of this series with archaeologist Dr. James Fleming at his Explorations in Antiquity Center, we'll glean some biblical insights by learning what in Bible times life was like being protected by city walls and in storing water.